Kleefeld on Comics: Which Are The Best Phantom Stories? I want to like The Phantom. I really do. I've read various versions of the character, ranging from some of Lee Falk's original strips to the contemporary one to the Charlton comic books to the DC ones to Moonstone ones. I've watched several of the cartoons and the Billy Zane movie. And I just haven't found any of the versions that interesting or compelling. But I still WANT to like the character. I mean, it sounds like a great concept. You've got this guy who fights injustice where it's needed, using whatever natural skills and training he can bring to the table. Plus, he passes down his mantle from generation to generation so there's a continuity across hundreds of years. He's got a pretty decent costume and he lives in the jungle. Not to mention that there have been some really great artists to work on the character, including the current strip illustrator Paul Ryan, whose work I've enjoyed for years. But I just haven't been able to really enjoy the character. So let me ask if anyone out there has any particularly favorite Phantom stories or creators that the could recommend. Any Phantom fans that can direct me to which stories will really sell it to me? Does anyone remember a cartoon from the late 80's / early 90's called "Defenders of the Earth"? Speaking for myself, I became a "Phan" with the DC series by Mark Verheiden and Luke McDonnell. 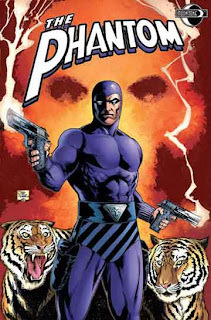 I used to read the Phantom as a kid in the 1980s as a newspaper strip, translated to Portuguese. The paper my dad bought had four strips: Winnie the Pooh, Hagar the Horrible, the Phantom and Garth (a British strip). Sy Barry's art as amazing, very detailed and expressive, while the stories happened in the dividing line between reality and fantasy. The problem is you're going to have trouble finding these stories. I've seen hardcovers reprinting the Phantom beginning with the 1930s material. The problem is that Ray Moore was simply atrocious, and his replacement Wilson McCoy uninspired. So I doubt there will be more volumes of that collection. It will never get to the good stuff. McCoy's death in 1961 paved the way for Sy Barry to take over the following year. While the Phantom had been a typical adventure strip up to that point, with Barry it became much more modern. The Singh Brotherhood, pirates, stereotypical witch doctors and exploitative gold prospectors were all thrown out. Barry inspired Lee Falk to come up with new stories, sometimes going to the realm of the fantastic and deliciously absurd, and then doing a 180 and talking about politics in a developing African nation that had to balance the modern and the traditional. Everything was much deeper, with the tribes now having specific characteristics, and new characters and the Phantom's family introducing more human aspects to the strip. Most comics, whether published by Charlton, DC or Moonstone, fail to deliver the same level of excitement as the Falk/Barry years.